Honda Motors came up its small hatchback car, Honda Brio last year, and it did manage to make a strong impact. Now, the firm is all set to bring in a new petrol variant in the range called Honda Brio VX . 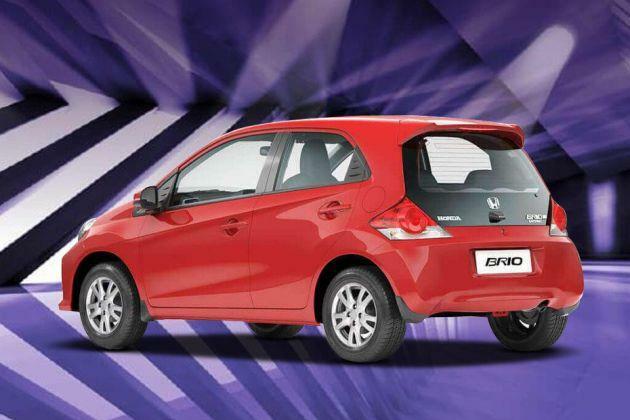 This one would be similar to the Honda Brio V MT and will feature similar traits like it. But to make it special, this one might come with some new features like rear de-fogger and height adjustable driver’s seat. Apart from this there are no other changes expected to happen in this new variant. The technical changes will not be done in this model and would be featuring the same 1.2-litre petrol engine that would churn out maximum power output of 86.8bhp along with peak torque of 109Nm. The 5-speed manual transmission will be coupled with the engine in order to make this car model frugal and fuel efficient. The looks of the car will not be changed and will come with the delicate and very alluring glass rear. This will be accompanied by chic and very trendy tail lights along with bold headlamp cluster on the front. On the inside, the new features like height adjustable driver’s seat and rear defogger will be seen. Apart from this, AC with heater, air conditioning system, power steering wheel, power windows and central locking system come as standard comfort features . The safety features in the car could be expected to be airbags, Anti-lock Braking System and power brakes. Honda Brio VX exteriors are expected to be the same as V MT variant. The combination of contemporary design with fantastic style will be seen here as well. The front profile will have elegant curves along with low slung front. The nose of the car would be impressive and a bit aggressive, which would be accompanied by big headlamps with a bit of chrome finish. The grille would be subtle. The side profile of the car will be made sophisticated with the presence of body coloured ORVMs minus the LED indicators. Coming to the rear part, Honda Brio VX will come with its characteristic glass finished wide windscreen with stylish tail lights. On the whole, the exteriors of the car are innovative and very stylish. Honda India would be making this model impressive enough to fetch some more revenue for the firm. The interiors of Honda Brio VX are expected to be unique and very sophisticated. The car will come with dual tone interiors using high quality material to build more class. The cabin design will also be impressive, which would provide ample of legroom and headroom for all occupants. The positioning of the power steering wheel will be ideal, while the retro hint would be give to the dashboard and audio system located on the stylish instrumental panel. The AC vents are shaped smartly, which modifies the entire front cabin design. The chrome hints will be provided in the cabin to add in a bit of glamour here. Overall, dual tone beige interiors combined with silver and chrome hints and ergariaic design will be making Honda Brio VX interiors very inspiring. Honda India will be maintaining high comfort level in Honda Brio VX as well. The car variant will be fitted with superior comfort features. The front cabin will have proficient air conditioning system with heater. The front AC vents are positioned aptly, which provide sufficient cooling to the rear seat passengers as well. Along with the AC, the car variant will also be fitted with power steering wheel, power windows, front adjustable seats, height adjustable driver’s seat, rear defogger, audio/CD player with FM radio fir entertainment and lots of storage spaces for keeping miscellaneous items. The boot lid on the other hand, will be capable of adjusting a lot of luggage thereby making your long road trips easy and unruffled. Under the bonnet, with no changes, Honda Brio VX will be blessed with the same 1.2-litre, 4-cylinder 16 valves, SOHC, i-VTEC petrol engine with 5-speed manual transmission. this engine has a displacement of 1198cc and is capable of taping peak power output of 86.8 bhp at the rate of 6000 rpm along with generating maximum torque of 109 at the rate of 4600 rpm. The pickup and acceleration of the car will be as good as its other variants. the hatchback will touch the top speed of 185 kmph and will reach 100 kmph speed mark from scratch in 16 seconds . On the other hand, impressive mileage figures could be expected from Honda Brio VX. This model will be delivering 15.2 kmpl of fuel evarian on the heavy traffic city roads, while on the highways 18.4 kmpl of mileage will be delivered. The braking and handling of the upcoming Honda Brio VX will be as strong as the Brio V MT model. The car variant will be blessed with disc brakes for the front and drum brakes for the rear . This could be further amplified by the presence of anti-lock braking system. Together, these could make the braking system of Honda Brio VX imposing and commanding. On the other hand, the handling of the car model would be smoothened with the presence of superior suspension system, comprising of McPherson Strut on the front and torsion beam axle for the rear. to improve the handling of Brio VX, the company will be providing the car model with power steering wheel. On the safety front, Honda Brio VX will come with all the basic safety features, which should be present in a hatchback. The structure of the car would be well-built and strong complimented by front and side impact beams. This would be further assisted by strong brakes, dual SRS airbags for the driver and front co-passenger, Anti-Lock Braking System, central locking system, seat belt warning, power door locks, child safety door locks , day and night rear view mirror, halogen headlamps, keyless entry and engine immobilizer.